Some stories are like that. You can read it again and again and then some more. You start smiling in anticipation, the feelings remain the same irrespective of the number of times you have read and relished it. And the end, that is why you go back. To relive some memories. The kind that make you feel this world is after all a good place. 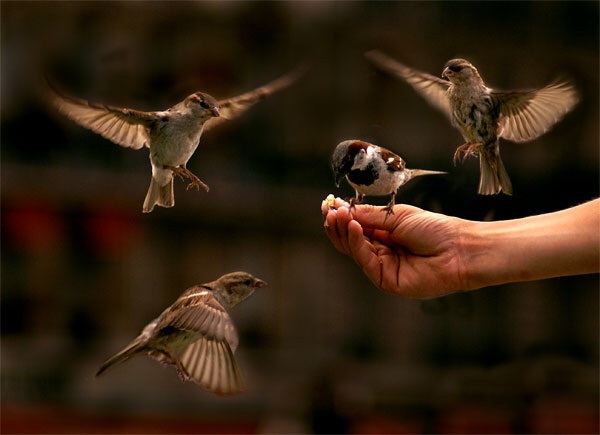 If not humans, there are sparrows and mango trees that care for you. Back in the village , they were good friends. The boy and the old lady. The tie began to fray as the family moved to the city and the boy’s horizon grew beyond the walls of their room and the road to the village temple. He got his own room and later moved abroad for higher studies. He didn’t expect his grandmother to be alive at the end of five years, when he came home. Yet, she was still there. The only change was she had started feeding sparrows instead of the stray dogs back in the village pathways. The prayer beads still continued to turn in her hand as her lips moved in prayers that only she could hear. Her demeanor changed one evening. Instead of her prayers, she started singing to the tunes of an old drum that she thumped along with the women of neighborhood whom she had collected. She was a wise woman. She knew her time was up and leave she did, peacefully as she prayed. The ending of the story leaves me with bittersweet memories. Every single time. Without fail. “We lifted her off the bed and, as is customary, laid her on the ground and covered her with a red shroud. After a few hours of mourning we left her alone to make arrangements for the funeral. The other end of the country, another wrinkled face. The hands were as hard as a man’s. Calluses left behind by a lifetime of garden tools. Hues of green fell on her hair that was now white. Seventeen trees that dropped mangoes in the night rain and daytime breeze. Then the others, each had their own season. Jack Fruit, Bambloos Naaranga, Cinnamon, Kokum, Guava, even Oranges. But it was for the mangoes that her eyes shined the brightest. Neelam, Salem, Moovandan, Chandrika and a host of other nameless ones. The ones that stained her grandchildren’s dresses as it oozed down in thick yellow down the young chins that quivered with mirth. It was a monsoon evening that she fell ill. She had a pact, with Mother Mary. To call her on a Saturday, that she could go directly to heaven. No purgatory in between. A straight pass. And Mary kept her promise. She went, on a Saturday evening. In style, thunder beating the drums and lightning showing the path. Straight, to heaven. December came, cold and dry. The leaves turned tender everywhere. And then burst out in dull green flowers. Like stars in the sky. But the seventeen that she left behind, they didn’t cry. Even a single teardrop. The yard lay silent that year.